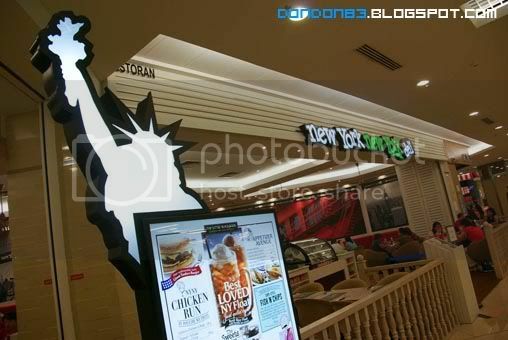 NewYork NewYork Deli Located at ONE UTAMA. pass by before.. didn't walk in .. dunno why.. untill i saw someone BLOG about it in Smashpop and Ewin Blog... gosh... then.. i'm HERE! TADA!!!! i FOUND what i'm LOOKING for!!! 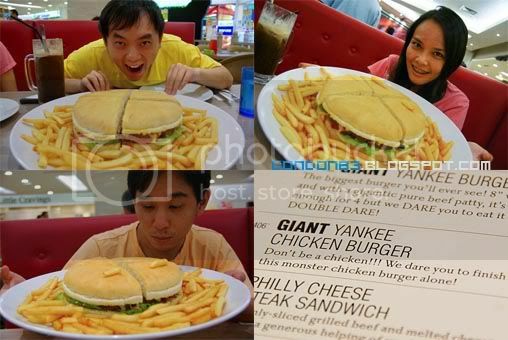 the GIANT YANKEE CHICKEN BURGER! 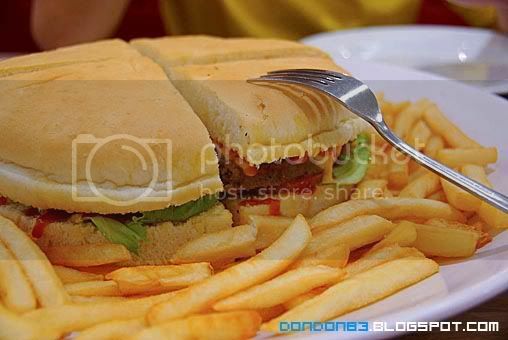 This BURGER is the LARGEST among all the burger i tried... 8" INCH wide... take your ruler and try measure it..
"Don't Be Chicken!!! 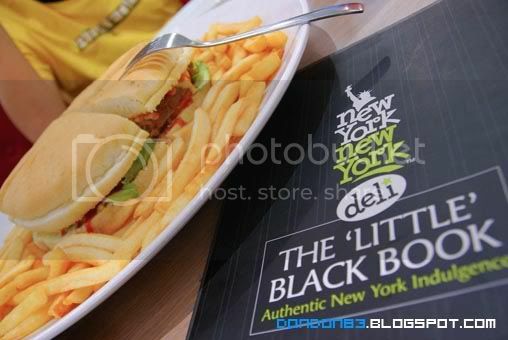 We Dare you to finish this monster chicken burger alone!" . wow.... the Person In charge told me IF we able to finished the WHOLE burger ALONE..(with FRIESSSS). 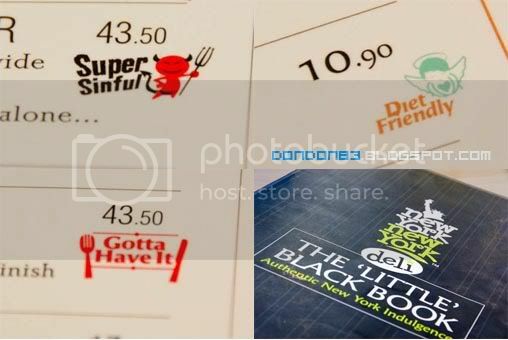 the MEAL is consider FREE... ermm.. erm... erm... Do You Dare to try it? Okay.. enough Talk.. I'm Hungry!!! Cheers the Chill ROOT BEER. 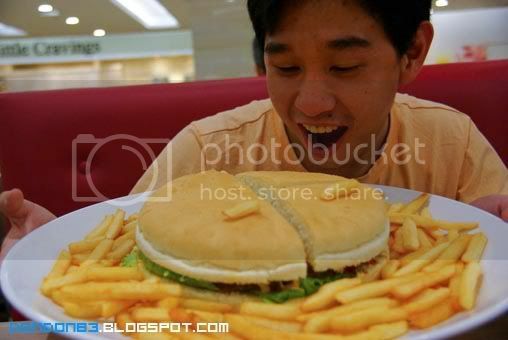 with my CUT of the GIANT YANKEE BURGER. and i skipped my dinner as well... (The Burger is my Lunch). 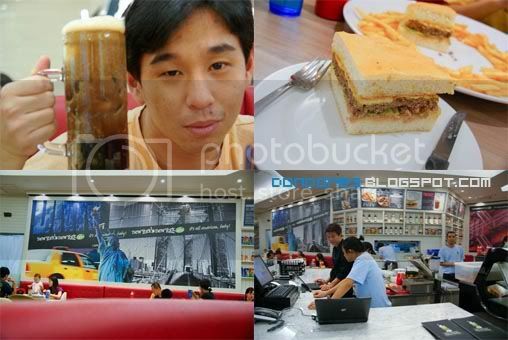 There is 3 Type of recommendation.. SUPER SINFULL (OMFG?) DIET FRIENDLY (gonna miss something..). and GOTTA HAVE IT(Tempting!!!)... 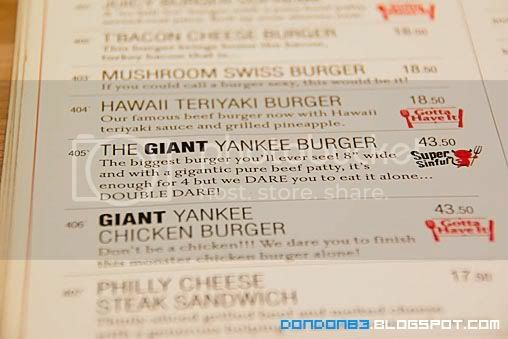 and the GIANT YANKEE BURGER is SUPER SINFULL!! !